Love to play video games? We do too! Share tips and tricks to create awesome games! 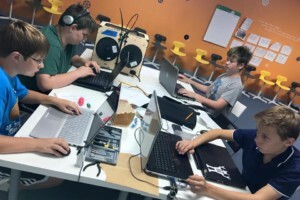 The Gaming Meetup meets once a month to play popular video games like Fortnite, Roblox, and Minecraft with other like-minded kids. 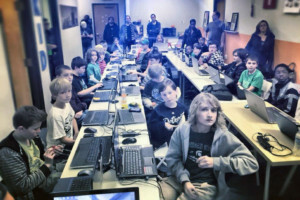 Kids will learn the latest updates on their favorite games, play with or against each other, and compare ideas about game design while eating FREE popcorn! Bring your laptop and gaming accessories and show-off your skills. This is Gaming meetup at its finest! All monthly clubs meet on Friday’s from 6PM-8PM. Click here for schedules. Learn STEAM (Science, Technology, Engineering, Arts, Math) education through play. The STEAM Club is for kids who love to tinker and innovate using our STEAM toys that are based on principals of Physics, Chemistry and Engineering. Each month, a STEAM project will be handpicked by our engineers to learn and create from a range of topics and concepts. Bring your laptop if you like and be prepare to get your hands dirty. There will be FREE popcorn. 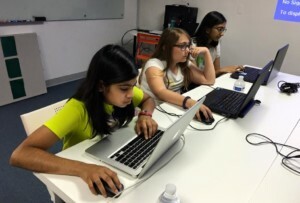 Computer programming is becoming one of the most needed skills in the future. We offer monthly clubs in an effort to encourage kid collaboration amongst a community comprised of their peers. Kids will be encouraged to share their ideas, goals, projects/portfolio, and engage in various challenges/projects based on the club’s theme. AccelerateKID clubs have been imagined with the intent to help boost your child’s self-esteem, improve creativity and inspire innovation.